Summary MU-MIMO enabled AC2600 class wireless router with Gigabit Ethernet ports and dual port USB 3.0 storage and printer sharing. 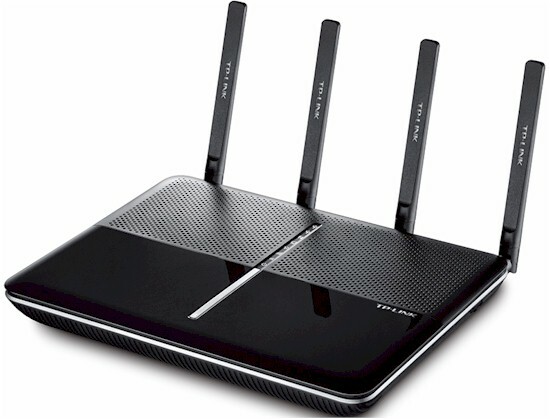 TP-Link's Archer C2600 AC 2600 Wireless Dual Band Gigabit Router makes the third QCA-based 4x4 router with working MU-MIMO to hit the SmallNetBuilder test bench. So excuse me if I dispense with the MU-MIMO background provided in the previous reviews. Hit Part 1 of the Linksys EA8500 review for a quick review of what MU-MIMO is and why you might care. You can also do a quick skim of the Amped Wireless "Athena" RTA2600 review to see how it fared. The rear of the C2600 has four RP-SMA antenna connectors, power connector, on / off switch and four Gigabit LAN ports and one Gigabit WAN port. There are no link / activity lights for the individual Ethernet ports. All you get is one LAN indicator on the top panel that lights steadily when something is connected to one or more LAN ports. The two USB 3.0 ports are on the router's right side, with other buttons shown in the callout graphic below. The bottom and back part of the top panel of the router have plenty of vent slots. There are no vents on the sides. The C2600 is designed to sit flat on a desk, but can be wall mounted via two bottom-panel screw slots that will orient the rear panel toward the ceiling. TP-LINK didn't put a short-term hold on its FCC ID docs, so I didn't have to open the router for component identification. The first picture shows the main board out of its shell, but with RF cans and heatsinks in place. Here's a closer picture with the cans removed. It's still not clear enough for component ID. But the FCC internal pictures file had close-ups of most key parts. Here's the bottom of the board with the two radios' RF cans intact. There are no heatsinks on these cans. Key components for the TP-LINK, Linksys and Amped Wireless AC2600 routers are summarized and compared in Table 1. Component-wise, the three are the same except for Amped's choice of QCA9990 radio vs. the QCA9980 used in the TP-LINK and Linksys designs. QCA describes the 9980 as aimed at router and gateway designs while the 9990 is for enterprise access points. Here are the Amped (top) and Linksys (bottom) board top shots for comparison. The components used may be similar, but these are three very different board designs, with TP-LINK the only one with the radios on the bottom of the board.